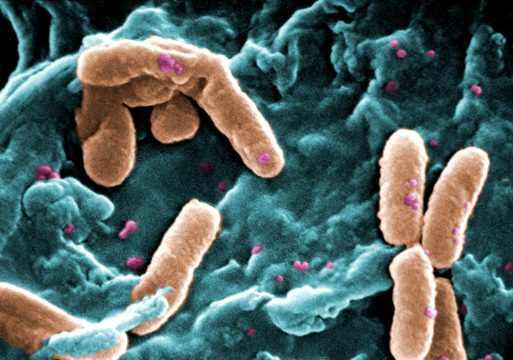 In a compelling new study, an international team of researchers—including George O’Toole, PhD, a professor of microbiology and immunology at the Geisel School of Medicine—has discovered that bacteria use multigenerational “memory” to successfully form biofilm communities. Bacterial biofilms are made up of genetically identical bacterial cells that can form colonies on almost any surface and establish communities where individual cells organize and cooperate. The findings, published in the Proceedings of the National Academy of Sciences, have important implications for understanding treatment-resistant infections, especially those caused by the bacterium that was the focus of the study—Pseudomonas aeruginosa. This strain of bacteria forms biofilms in the airways of cystic fibrosis patients, causing persistent infections that can be deadly. In the earliest stages of biofilm formation, bacteria must first gather sensory information about the surface and then develop the ability to attach to it. For the first time, researchers were able to track the actions of whole lineages of single cells and discovered that the descendants were able to “remember” surface sensing signals of their predecessors. This allowed cells to return to the surface progressively better adapted for sensing and irreversible attachment, the first step in committing to a biofilm. “It was really exciting to me that we’ve learned how reversible and irreversible attachment are linked during early biofilm formation,” says O’Toole, the study’s collaborating senior author. “These concepts were described in the 1930s, but it took us almost 90 years to understand how they work hand-in-hand to help drive early biofilm formation. This work was part of a multidisciplinary effort with investigators at UCLA and Oxford University.